Jim and I have traveled all over the world and although we’ve been to many exciting destinations, we both agree that Provincetown, Massachusetts remains our very favorite vacation spot. This totally preserved New England town, brimming with history, sits at the very tip of Cape Cod. In 1620, at the end of a 60-day journey on the Mayflower, the pilgrims sighted land and first anchored in what is now Provincetown Harbor. Over the years, Provincetown became a fishing and whaling town and by the 1890s the booming community began attracting a residential population of writers and artists. By the early 20th century, Provincetown had developed a worldwide reputation for its literary and artistic productions, including the Provincetown Players and the Cape Cod School of Art. Famous writers, such as Eugene O’Neill, Tennessee Williams, Truman Capote, and Normal Mailer, sought inspiration in Provincetown. In the mid-60s as the population grew, P’town as the locals call it, saw an influx of hippies moving in and opening cafes, leather shops, head shops, and other hip businesses along Commercial Street. Over the next forty to fifty years, Provincetown grew as a popular tourist destination. The population ranges from roughly 3,000 in the winter months to 60,000 during the tourist season. Pictured above is an aerial view of Provincetown from the top of Pilgrim’s Monument in the center of town. The beaches of Provincetown are stunningly beautiful. This photograph depicts a classic New England lighthouse taken on a walk to the beach. A bustling landmark in Provincetown, the Lobster Pot serves pounds and pounds of lobster to hungry tourists. We just returned from a week’s vacation in Provincetown with a group of friends. I’m sure you can guess that one of the highlights of the trip for me was food. I can see the surprise on your faces! My goal for the week was to eat as much lobster as I could. Ubiquitous in P’town restaurants, lobster is served in many different forms. I took full advantage during the week and enjoyed lobster rolls, lobster salad, lobster and sole roulades, a New England Clambake with lobster, and lobster bisque. Even after a gluttonous, lobster-eating week, I had to share my love of lobster with you all. 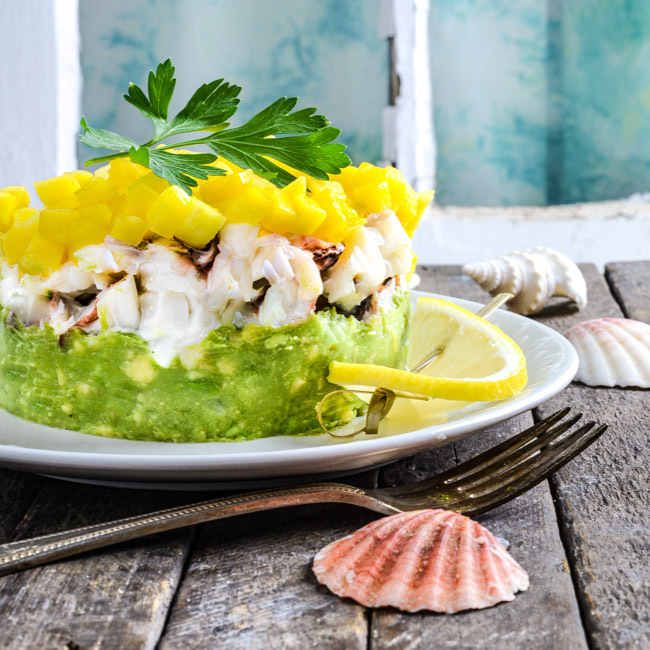 For today’s post, I made a very simple lobster, avocado, and mango stack. This dish is quite simple in its ingredients and flavors. The only challenges is in building the stack. I used a 28-ounce tomato can opened at both ends to build the stacks and it worked well. If your stacks aren’t perfect, don’t fret. They will still be delicious. These stacks make a great lunch but you can use a smaller can to make salad/appetizer-sized portions. 1. In a small bowl, whisk together mayonnaise, lemon zest, lemon juice, 1/8 teaspoon salt, pepper, and garlic. Cover and refrigerate for 15 minutes. 3. In another small bowl, mash avocado, 1 tablespoon lemon juice, 1/4 teaspoon salt, and onion with a fork until slightly chunky. 4. To assemble stacks, open a 28-ounce can of tomatoes, remove contents, and remove bottom end of the can. You should end up with an open-ended cylinder. Place can over a salad plate and put 1/4 of the avocado onto the plate inside the can. Using a spoon, push the avocado against the side of the can, forming a slight bowl shape. Top avocado with 1/4 of the lobster, pressing slightly with the spoon. Top lobster with 1/4 of mango. Very slowly and carefully, lift the can off of the stack. Garnish with parsley and lemon slices. Serve immediately. That looks and sounds amazing! I had to laugh, though, because all 3 of the star ingredients are things my bf doesn’t like at all… 4 things if you count the onion. 🙂 But *I* think it sounds absolutely delicious! This sounds sensational! Gorgeous presentation! I will have to put Provincetown on my list of must visit places! That picture you took of the lighthouse is spectacular! Wow. How much more American can it get? The Pilgrims, Provincetown, and lobster. Plus an absolutely iconic little restaurant. What a wonderful post, and congratulations on some stunning photography. That’s one very clever and enticing little recipe you’ve got going on there. Bravo, Southern Boy. Bravo!